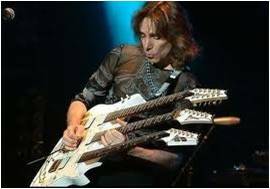 The fret hand wrapping around the neck is held in extreme wrist flexion for extended periods of time with little to no wrist extension. 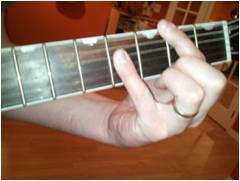 Some chords/fingerings utilize finger flexion to a much higher degree than finger extension. The head may be held in extreme flexion to look at the hands, etc. These examples all demonstrate how one motion at a joint may be utilized to a much greater degree than it’s opposite (or antagonistic) motion. Even as guitarist become more experienced and learn how to use less force, there will still be more exertion in one direction for many activities. As the imbalanced exercise continues of months, years and decades, muscle strength imbalances will result. All the muscles around any given joint need balanced strength pulling in each direction. For example, the muscles that pull your fingers forward need strength comparable to the muscles that pull your fingers backward, to the outside, to the inside, into opposition, etc. If one muscle around a joint is stronger or weaker than the rest, the bones of that joint will not remain properly centered. Each time an imbalanced joint moves, it will tug to one side, leaving you at a mechanical disadvantage. This imbalanced motion will stretch, scrape or pinch tissues abnormally, causing some damage. As a result, your speed, power and endurance will suffer and your chance of developing pain and injuries increases. Thoracic Outlet syndrome – Guitar straps depressing the shoulder can cause pain which radiates from the shoulder down the arm. 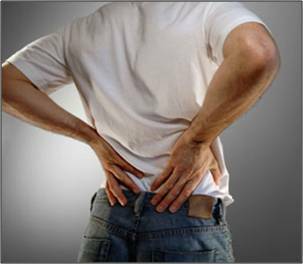 Lumbar strain – holding the weight of the guitar can imbalance muscles and cause low back pain. Contact: Dr. John M. Wallman, DC to arrange an appointment to evaluate your music related biomechanics at DoctorWallman@GMail.com. His background includes: 4 years at Manhattan School of Music; undergraduate studies of music education and; plays over a dozen instruments. In his health care practice, he has specialized in Performing Arts Medicine and written the exercise manual “Finger Exercises for Musicians”. He is President of the Diagnosis Foundation and practicing at Long Island Integrated Medical in Ronkonkoma, NY.